Best DWI DUI Refusal Defenses NYC. Used by former prosecutor. Driving is not a right, it's a privilege. Since it's a privilege, New York can place certain restrictions on driving. Once such restriction is that all New Yorker's who obtain a driver's license agree to provide either a breath, urine or blood sample when an officer has probable cause to believe that you are driving under the influence of drugs or alcohol. This is commonly known as "implied consent." Refusing to provide a sample is a misdemeanor criminal offense and you may face up to one (1) year in jail (likely no, but a possibility yes). Penalties for refusing to provide a DWI / DUI sample: The first time that you refuse a chemical test, your driving privileges will automatically be suspended for one (1) year and you will be fined in excess of $500. The second time you refuse, your license will be suspended for one and a half years (18 months) with increased fines. However, if you are suspected of DWI DUI and you have caused significant property damage or great bodily harm to yourself or another, then the cop will seek a search warrant and forcibly obtain a chemical sample from you, with or without your consent. Please note, penalties for commercial drivers who refuse to submit to a chemical test are more severe. All criminal cases are won, and lost, based on evidence. Evidence of a DWI / DUI will make or break the prosecuting attorney’s, aka Assistant District Attorney’s (ADA), case. NYC Assistant District Attorneys love cases where a defendant provided a breath, urine or blood sample that is over the legal limit of .08 because they can show the jury forensic evidence. In this age of CSI shows and movies, the jury comes to expect hard evidence (this is commonly known as the CSI effect). As a former prosecutor, I reviewed hundreds of DWI / DUI tapes. Rarely was the defendant fall down drunk when they refused to provide a breath sample. As a former prosecutor I had to emphasize the smell of alcohol, balance, driving pattern, etc. Now as a DWI DUI criminal defense lawyer, I pick these things apart, one by one, weakening the prosecuting attorney’s case. While every case is different, our NYC DWI / DUI lawyer has extensive experience and knows where to look for weaknesses in the ADA’s case. Call today and have our attorney provide a free case evaluation. Miranda Warnings; when do the cops have to read them? The truth is, the police don't have to give Miranda Warnings unless you are in custody AND you are being interrogated. Are you in custody when the police stop you for a rolling stop? Generally, traffic stops are not considered "custody for the sake of Miranda, but a routine traffic stop can evolve into a situation where you are in custody. 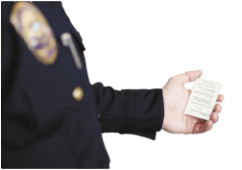 Traffic stop; do you have the right to attorney ? No. Plain and simple. But it helps to think like you do have a right to an attorney. If your attorney were present would he/she want you talking to the police? No. Would your attorney want you to give permission to search your car? No. Would your attorney want you to give permission to search your purse? No. When dealing with police, put yourself in the right frame of mind. It's one thing if an officer approaches you and asks "Is there anyone in that burning building?" By all means speak up! It's another thing when a cop is accusing you of something. There is really nothing you can say that will help your situation. Focus, and if asked any questions keep saying "I want my lawyer. I want my lawyer. I want my lawyer." You don't have a right to a lawyer yet, but this sends a clear message to the cops, "leave me alone!"